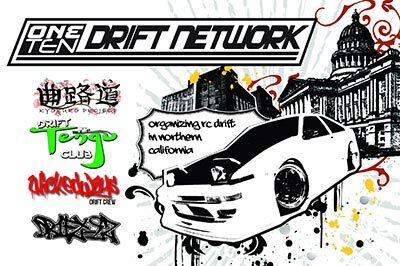 One Ten Drift Network started in Sacramento in August of 2008. Starting as 3 people in a parking lot and rudimentary RC Touring Cars converted for drift. Over time though the group has expanded from Sacramento to dealing with half of California. We are a group, not a team which means that we welcome anyone that wants to try out RC Drift. The group meets from 2-4 times a month and occasionally organizing demonstrations and competitions. Our goal is simple, to create a fun environment for people who enjoy the hobby. We provide the information on how to start and help people to advance in the hobby. We do this all with our own work and funds. We believe it is a better thing to present to people than some of the less beneficial things that they could be doing with their time. In this way we consider it to be close to a community service.